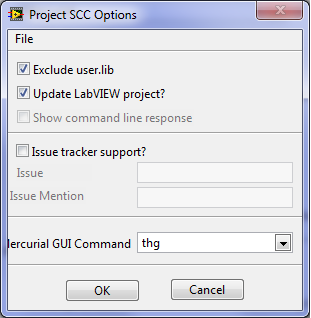 I have released a Mercurial extenstion to the LabVIEW supplied SCC Project Provider interface. It's been a bumpy road that took a long time (the first code over two years old), NI has been very generous with the sparse documentation available. Currently I am adding features to the Mercurial extension, but I would like to expand into other SCC's (git for instance). Feel free to download and try the code from bitbucket and install with VIPM in LabVIEW 2011 (and up). Thanks for sharing this with the group. This looks like it could be a very useful tool for those using Mercurial. Are you planning on releasing this on the LabVIEW Tools Network? If so please let me know when you are ready and I'd be more than happy to start the process with you. I tried installing the Mercurial Provider and it seems to hang up on installation because of the missing dependency "MercurialAPI >= 0.3.1". Where does one find this package? [Edit] Found it on the LAVA Code Repository. Any chance that this can be included with the package so installation is smoother? I'm not too keen on wrapping up the Mercurial API inside the Project provider, it would mean that the same code could reside twice on the users side, and if I update the Mercurial API I have to re-release the Project provider. But perhaps I'm going that route. That's understandable. Perhaps if/when you end up submitting this to the LabVIEW Tools Network we can add the Mercurial API as well. Thanks again for showing us this tool! I have some issue with the provider, the icon overlay don't change when I check out files. And I can't check in file because the status of the files are clean. Do I need to setup something special in my Mercurial to get it working properly? I have installed the x64 Mercurial with Tortoise. My Os is Win7 French, LabVIEW 2011 English. You've setup the project provider up correctly. But since Mercurial doesn't do 'check out' (and I cannot blank that option in LabVIEW), you won't see the status update automatically. After you've saved an edit, you could issue an 'SCC Update status', then LabVIEW will allow you to check in (commit). One option on my side woulde be to check the status upon a 'Check Out' and update the LabVIEW project. I'm impressed with how well this extension works on LV 2017. But I notice that every so often, doing a <CTRL> + <SHIFT> + <S> Save All will bring up the Commit window, and after I commit whatever I was working on, LabVIEW seems to exit completely unprompted. Any ideas why this occurs? It only happens occasionally, but really disrupts workflow. Also, did you ever do anything with git integration? I've noticed that one thing that brings up the commit window is the <CTRL> + <C> command after opening Quick Drop. I may have read that this is intended behavior. However I have been using MGI's Class Method Browser whose shortcut is also <CTRL> + <C>. Of course this causes a collision. But, when I try to change the keystroke for the Class Method Browser, it also changes the keystroke for the Commit command (i.e. pressing <CTRL> + <M> brings up both the Class Method Browser and the Commit window). Any idea why that would be? Is there a simple way to disable the keystroke for this?